Census 2011 data shows a 98% increase in Tamil Nadu’s migrant population, 77% in Kerala’s; 69% of migrants are women . MIGRATION patterns in India are increasingly reflecting the economic divide in the country, with more migrants over the last decade heading to the southern states, which have grown at a faster clip during this period. According to Census data released on Thursday, southern states, especially Tamil Nadu and Kerala, have shown the highest increase in migrant population. With 45.36 crore migrants in India, every third citizen of the country is a migrant. Of these, 69 per cent are women, majority of whom have cited marriage or having migrated with their husbands as the reason for their translocation. Migrants constitute 37.8 per cent of India’s 121.03 crore population. Over the last decade, the total number of migrants in India rose by 44.35 per cent from 31.45 crore in 2001. During the same period, India’s population grew 17.64 per cent. The present study considers migrants by place of last residence — those who have last resided at a place other than their place of enumeration are deemed to be migrants. The study, however, does not point out whether these are interstate or intrastate migrants. 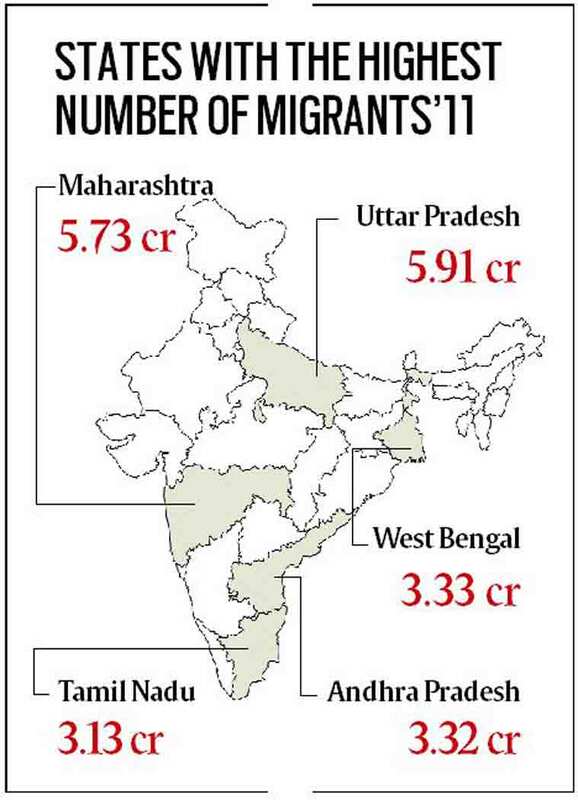 Tamil Nadu’s migrant population surged 98 per cent from 1.58 crore in 2001 to 3.13 crore in 2011. During the same period, the population of the state grew by 15.6 per cent. Migrants now constitute 43.4 per cent of the state’s population compared to 25.44 per cent in 2011. Kerala’s migrant population has grown by 77 per cent – from 0.92 crore in 2001 to 1.63 crore in 2011. The state’s population in the same period grew by 4.9 per cent. In Kerala, nearly 49 per cent of the population called themselves migrants as against 28.93 per cent in 2001. Karnataka too has shown a 50 per cent increase in its migrant population – from 1.66 crore to 2.50 crore. Only Andhra Pradesh, with a 40 per cent rise in migrant population, has shown a growth below the national average — its migrant population increased from 2.34 crore to 3.32 crore during this period. “The socio-economic development of the southern states is considerably higher and that attracts people. Another factor is that because of better education levels and awareness, local residents of these areas get drawn towards better economic opportunities. This vacuum that gets created gets filled up by people from outside. These developed areas face a crisis of manpower, especially for low-skilled jobs, which leads to migration,” says Dr Abdul Shaban, chairperson of the Centre for Public Policy, Habitat and Human Development at the Tata Institute of Social Sciences. The only other states which have shown a higher growth of migrant population are Meghalaya and Manipur, where the number of migrants have grown by 108 per cent and 97 per cent respectively. For Jammu and Kashmir, it was 55 per cent and Assam 52 per cent. While globally, migration is attempt by people to survive and prosper, in India, marriage appears to be the biggest reason why people migrate. Of the total 45.36 crore migrants, 22.39 crore or 69 per cent people referred to marriage being the reason for their migration. Only 5.07 crore (11.17 per cent) of the migrants termed work and business as causes, a marginal increase over 2001, where economic migrants stood at 10.39 per cent of the total. While marriage remains the primary reason for women to migrate, the Census data shows that Indian women are also migrating for work and education. The number of Indian women who are economic migrants — moving for the sake of work, business or education — has grown by 129 per cent: from 0.51 crore in 2001 to 1.17 crore in 2011. During the same period, the number of male economic migrants grew by 51 per cent — from 3.09 crore to 4.7 crore.